Drive through any town or city and it is often the case that you will see domestic doors fitted in shops and other public buildings. However according to current Building Regulations, the fitting of PVCu panelled or glazed doors is not acceptable because they cannot be specified with the hardware that is required to comply with BS8300, Approved Document M and the all important EqualityAct 2010. Professional window installers acknowledge that for commercial buildings only aluminium commercial doors will do. However the installation of what is arguably not fit for purpose doors continues with many residential entrance doors be they PVCu, aluminium or timber being installed in non dwelling situations. Why are the wrong types of doors installed in public buildings? In this article we will examine scenarios where the wrong types of doors have been installed. We will offer some guidance for installers, shopkeepers and for commercial buildings as to why wrong doors are installed and what can be done about it. Liability for the consequences of failing to comply with the relevant regulations can fall on the building owner, the manager of the building or potentially both. Let alone any considerations as to the terms of a commercial lease. However is it also the fault of the window company and the installer for supplying the wrong product because they were be unaware of what exactly needs to be installed? Why is it important what kind of door is installed? The type of door installer. In the construction of new commercial premises an architect will be involved. Where this is the case it is unlikely the wrong product will be installed. Having said this, it is well known in the sector that Architects will spend a huge amount of time and resources drawing up comprehensive building specifications for the tender stage of a project.This specification drawn up by an Architect will often be firm even to the point of specifying the door or window system to be used and even who is to install it. But it is not uncommon when a project reaches the stage where it is secured by a main contractor that cost savings well be sought and often breaking specification is one area where money can be saved. Therefore whilst a knowledgable architect will rarely specify a plastic door in a commercial building this is sometimes out of his control. The main contractor or builder. A main contractor will often rely on the expertise of the sub contractor trades. For the window installer about to embark on tendering for a project it is not uncommon if they receive a specification for a product that they do not supply for them to quote using an alternative. If this alternative product is cheaper than the one specified and again several parties are looking to find cost savings, it is another situation where the wrong product may be installed due to the specification being broken. If we use a local shopkeeper as one example of “the client” they will often be the first point of contact when a new door to his premises is required. The local shop owner or member of the public responsible for a building may start the process for installing the wrong product in their premises. And there are several reasons why. Lack of knowledge is the most common reason. It is often the case that a shop owner had double glazing installed in their home by their local domestic window firm. They will have no idea of what kind of door must be fitted to their shop all they know is that they need a new door. Consequently they will call a local firm or one they have used before themselves in their own home. If they call out a domestic firm with no knowledge about commercial doors this is a classic scenario where the domestic window firm views this as a simple door and window job. Here they will sell whatever product they can to secure a sale with no thought or consideration for the legal considerations involved.Even if they call out a firm that does offer commercial doors it is the knowledge of that particular window firm that will determine whether the right type of commercial door that meets the required specifications will be installed.For larger scale construction projects, the client will be relying upon the professionalism of their architect, quantity surveyor, builder and other professional people involved in the project. Therefore the above scenario is far less likely to ever apply. The experience of the door installer is also critical in ensuring that whether the correct commercial door is specified. Whether they make their own doors or buy them in from trade supplier can so be key reasons for not meeting specifications. Our article for Door Manufacturers and Installers explains more about the supply process for commercial doors. For those window companies that buy in all their products ready made from a supplier it is unfair to expect the supplier to ensure that commercial doors are correctly specified. Whilst there is an argument that a commercial door will probably only be going into a commercial building and must therefore comply, what the trade manufacturer will never know is where those doors are located and if there are other doors in the building that do comply as part of “reasonable adjustments” called for in the Equality Act. Most professional trade suppliers have comprehensive order forms to ensure that in the absence of a site visit or other information they make the doors correctly. Automatic doors are one way of achieving instant compliance for accessibility. 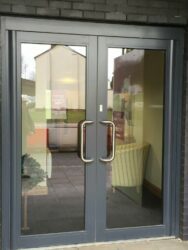 An incorrectly supplied plastic door fitted to a school. A community centre incorrectly provided by a local firm with domestic quality woodgrain doors. Quirky and memorable but doesn’t meet current standards. A commercial building fitted with a domestic plastic panelled door found in dwellings. Contrasting colour handles to assist the visually impaired. An aluminium door with anti finger trap stile and low threshold. Aluminium commercial doors installed in 1989 and still performing today. A recently constructed care home. All windows and doors PVCu, except for main entrance that fully complies with Regulations. Even local small shops have an obligation to meet current standards and Equality Act. Three sets of doors with high step to access, but one door provided with an access ramp. A good example of an Equality Act, BS8300 and ADM compliant entrance door. The elderly and disabled have a right to easy access to shops and services. Does the correct specification and installation of doors matter? Building Regulations, Legal frameworks and British Standards all exist for a reason. The general domestic home improvement industry is very focused on their marketing efforts in promoting window energy ratings, security, design and rightly promoting themselves as competent and expert installers. However there is an argument that these very competent domestic installers are falling short when it comes to providing compliant commercial products. This is even more important when we consider the very large number of people that actually use commercial doors in public buildings compared to the doors in dwellings. Lack of information and education by many in the supply chain is also a reason. One only needs to look at the dismal failure that was the Green Deal at launch to see how not getting the right message across correctly can affect a scheme or initiative. Systems companies, trade manufacturers and the window industry bodies and federations are also either unaware or simply not providing the home improvement sector with the right information . the requirement to withstand high traffic and be reliable unlike domestic PVCu doors. the ability to meet legal requirements and legislation. Ultimately the correctly specified commercial door in any public building enhances the user experience in the same way a domestic product does. We know of cases where claims against service providers have been brought by the disabled and other groups but these are largely settled out of court and not making the news. We’ve tried to cover the basics of what is potentially a complex area of regulation. We give this information based on our understanding of the legislation and regulations as of May 2015. Regulations do change over time. If you are in need of advice about your specific circumstances we recommend that you consult your own suitably qualified advisers. We also recommend that you consult the current Building Regulations Documents that provide information about how doors can comply with Approved Document M, BS8300 and The Equality Act.